Your company has already made the decision to IPO and is prepared to do so, but you are waiting for the opportune moment. Timing the market is a major concern for pre-IPO companies because millions of dollars in funding are potentially at stake. In fact, a Deloitte survey found that “about one-third of companies view timing the market as the biggest concern when considering an IPO.” Because of the anxiety surrounding IPO timing, companies often look for market “windows” during which a public offering has a better chance of maximizing the valuation of the company. This article will explore factors that can help you identify open market windows: the Volatility Index, industry competition, and the performance of recent IPOs in your industry. Then, the article will provide practical advice on timing your IPO. One of the strongest indicators of an open IPO window is the CBOE Volatility Index (the VIX) which measures investors’ expectation of volatility in the S&P 500 over the next 30 days. The VIX is often referred to as “the fear index” or “the fear gauge” because it measures investor uncertainty. Conversely, when the VIX is below 20 for an extended period, the number of monthly IPOs increases dramatically, and the IPO window is considered “open.” An added benefit for companies that IPO during these market windows is that increased demand generally results in more favorable pricing. The decrease in IPOs during times of volatility is best understood when considering how stakeholders in the IPO react to risk and uncertainty. Institutional investors want to make a return that sufficiently rewards them for the risk they take in investing in an IPO. Volatile market conditions increase investor risk, driving up the required return — which leads to a meaningful discount on a company’s stock. Companies may be unwilling to decrease the stock price to a level that is acceptable to investors when the market is volatile and instead choose to wait for more stable conditions. In addition to having the same concerns as institutional investors, underwriters are also worried about the reputational risk associated with a failed IPO. Underwriters work to find an offering price that satisfies both the institutional investors and the company going public. Finding that mutually agreeable price can be difficult even in good market conditions, but it is especially difficult in times of high volatility. For example, if the underwriters set the price range too high, and the stock price declines in initial trading, then institutional investors will incur losses, which damages the underwriters’ reputation. To avoid these potential issues, underwriters are normally more conservative when the VIX is high. They may prefer to wait until the dangers described above are less prevalent or, alternatively, they may offer the shares at a steeper discount. The desire of underwriters and institutional investors to protect themselves from financial and reputational losses conflicts with the company’s desire to raise the capital they need without excessive equity dilution. 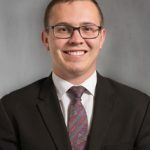 These competing interests can make it difficult for all the involved parties to come to an agreement concerning company valuation and offering price. During volatile market conditions, a company can either decrease the price range to increase demand or delay the IPO until uncertainty decreases and market conditions improve. Both options can have their disadvantages. Initial discounted share price is just one of the possible disadvantages when a company chooses to move forward with an IPO during volatile market conditions. In the months following the IPO, volatile market conditions can also lead to rapid changes in a company’s value. Large declines in share price can damage a company’s reputation with investors and make it more difficult for founders and employees to liquidate their shares. Receiving a low valuation or experiencing a large price decline in the months following the IPO could also make new investors hesitant to purchase shares, demoralize employees, and disappoint the company founders and other early investors. It could take months or years to recover lost market capitalization and restore market confidence. Still, despite these potential disadvantages, the negative signals that a withdrawn or significantly delayed IPO will send to the market could be just as damaging as entering the public market in volatile conditions. Therefore, companies that have already publicly filed for an IPO should be cautious about waiting an extended period of time before pricing. This is one of the reasons US filers often take advantage of the JOBS Act, which allows a company to submit draft registration statements confidentially during the SEC review process and only file publicly when required in the final weeks leading up to the roadshow. In many cases, companies are not willing to reduce the price range of the offering to appease investors and underwriters, so they more commonly delay the IPO. Whether your company chooses to continue with an IPO during volatile market conditions or to wait for a short period until the VIX drops, the possible disadvantages of either option should be carefully considered. The current competitive landscape and outlook of a company’s industry can influence IPO timing strategies. The actions of competitors can be especially impactful in emerging, high-growth industries where companies are fiercely competing for market share. For example, there are several advantages when a company is the first to IPO successfully in a competitive industry. One of the biggest benefits is the ability to capture more market share by leveraging the infusion of capital and increased publicity generated by the IPO. In fact, many of the advantages discussed in our article IPO Advantages and Disadvantages can be of even greater benefit to a company attempting to capture market share in a competitive industry. Of course, being the first publicly traded company in an industry can also have its disadvantages. When a company goes public, it must report quarterly and yearly financial statements. While this information is important to investors, it can also be used by competitors to gain more insight into the company’s strategy and operations. Competitors could use this information to improve their own strategies and operations, putting themselves in an improved competitive position. The outcome of the IPO also reveals valuable information about the industry to future investors and competing firms. In his paper IPO Market Timing, Aydogan Alti found that “if the offer prices of IPOs in a given month exceed expectations, the IPO volume in subsequent months increases dramatically. If, on the other hand, the offer prices turn out to be lower than expected, the IPO market dries out.” These findings indicate that the performance of early IPOs reveal information about the industry’s prospects that may be advantageous to other companies in the industry that plan to execute an IPO. Blue Apron’s IPO clearly illustrates how competition in an industry can affect IPO timing and success. Blue Apron went public on June 29, 2017—just 14 days after Amazon announced plans to acquire Whole Foods. Blue Apron had planned to sell 30 million shares at $15 to $17 per share, which would have raised up to $510 million and resulted in a valuation of $3.2 billion. If Blue Apron had executed its IPO one month earlier, this valuation could have been possible. However, the company’s shares were ultimately sold for $10 per share, raising $300 million and valuing the company at just $2.1 billion. Blue Apron was one month and $1.1 billion too late. While Blue Apron could not have foreseen and planned for Amazon’s announcement, and while many other factors contributed to the outcome of Blue Apron’s IPO, this example underscores how timing can drastically affect the success of an IPO. Unfortunately, most of the timing issues related to pricing your IPO such as VIX levels and industry outlook are out of your control. While you don’t have control over these factors, understanding them can help you recognize when IPO windows are open and when it may be better to wait. Your company should also leverage the expertise of your underwriters when considering the factors that affect IPO timing. Your underwriters can give you advice about timing factors specific to your company’s situation. Delay if Necessary. One way to avoid entering the market at an unfavorable time is by being in a position that allows you to delay your IPO if necessary. If your need for capital is critical, then you may have no other choice but to go public and risk having a less favorable result. But if you structure your business strategy in such a way that going public is not urgent, you will not be forced to go public at a time of uncertainty. Prepare Early. Preparation is also key. When a company is prepared for an IPO, it has the ability to jump into the market when the IPO window begins to open. A company should have efficient financial reporting systems, well-trained personnel, and corporate governance practices in place to be prepared for an IPO. If these preparations are in place, your company can be ready when the window opens. For more general information on how to prepare for an IPO please see our article Overview of an IPO. The milestones that your company chooses may be different, but setting clear milestones will help management and the board be on the same page about what “prepared” means for your company. If (1) your company has the numbers to be public, (2) your company is ready and prepared to be public, and (3) the IPO market is healthy and the window is clearly open and you still chose to wait to go public then you are accepting the timing risk of the future. Timing the market should be a major consideration for companies planning to go public. 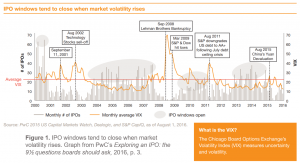 While it is impossible to predict when a market window will open or close, an understanding of the factors that indicate that the IPO market window is open – such as the VIX index, industry performance, and competitive landscape – can help companies avoid the disadvantages of poor IPO timing. Your company should prepare early, and act without hesitation when the window appears to be open. By following this advice, your company can maximize its chances of hitting a market window and, as a result, raise more capital at a higher valuation. 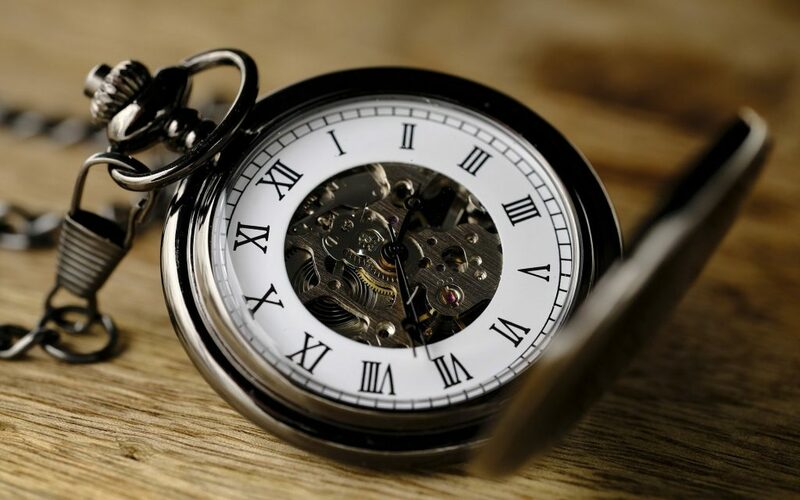 Deloitte Private company IPOs: Is timing everything? A down round occurs when a new funding round values the company lower than a previous funding round.